One could have predicted the outcome of this case after Apple’s capitulation to the Solicitor General’s argument that determination of the article of manufacture is a question of fact. Thus, Apple agreed with the government and with Samsung. What was the Court to do? So, after relying on the dictionary (!) to determine what “article of manufacture” meant, the Court punted the ball – a medicine ball – back to the Federal Circuit for the hard part. Clearly, the first article of manufacture is not the same as the second. The first refers to the patentee’s product, the second to that of the infringer. The critical word “any” in sec. 289 was ignored by the Court. The use of “any” makes it quite clear (from the Court’s beloved “text”) that the total profit is that made on sales of the infringer’s product – any product – to which the patented design (that can be an entire patented product or a patented component/portion of a product) has been applied. That is what the statute says. The bright side of the opinion – if there is one – is that the Court declined to fashion its own test for determining the article of manufacture. This came after the issue was the center of attention at oral argument. And the Court threw up its hands, obviously unable to agree on any of the numerous tests proposed in the amicus briefs. So, we now enter a long period of uncertainty. Accused infringers will no doubt take the position that the article of manufacture is less than the entire product that they are selling, while patentees will take the opposite position. Until the Federal Circuit establishes a test, and that test is applied by the district court to evidence it has yet to take, and its findings are then appealed again to the Federal Circuit, and the loser of that appeal files for an en banc rehearing, and then a Petition for Cert. to the Supreme Court (that will hopefully be denied) this issue will be unsettled, and thus will adversely affect enforceability of design patents against copycat knock-offs (the primary use of design patents), as well as inhibit settlements of design patent disputes. we now enter a long period of uncertainty. I doubt it will be that long. And design patent law is a complete mess so it’s not like “uncertainty” is something new. Here’s one thing you can be absolutely certain of: if you’ve got the money, you can use junky design patents to create a living h e l l for your target. And that’s totally awesome, right? Because progress in ornamental virtual buttons. Accused infringers will no doubt take the position that the article of manufacture is less than the entire product that they are selling, while patentees will take the opposite position. And in nearly every one of the interesting cases, the patentee will be wrong. That much is also certain. And the fault is somehow not with the CAFC for not just devising a test rather than finding a plurality of support for myriad absurd, disproportionate, unsustainable outcomes like the loss of all profits on an automobile for an infringing cupholder? We may have combined law and equity in the lower courts, but the Supreme Court cannot evade the inherent right to equitable judgement that the Constitution guarantees. Night is right that this was an equitable judgement, as was KSR. Millions of patents mean tens of thousand that are very, very close calls where the only just outcome may be an equitable remedy- on obviousness, design, abstraction, etc. Unanimous USSC decisions in patent case after case after case that amount to equity decisions are not a theoretical possibility- they are recent history. The patent bar needs to lose its addiction to giant paydays based on quirky technical bonanzas arising out of the complexity of patent law. It’s all over, but the old rituals will die hard. Celebrating that a score board is broken won’t fix the broken score board. Please learn the difference between statutory law and common law, the separation of powers doctrine, and how patent law was expressly delegated to a single branch (hint: not the judiciary) in our Constitution, and what that entails for the ability to legislate from the bench. Until then, your feelings are noted. Patent law was NOT expressly delegated to a single branch. Wake up son. All three branches are involved in all three spheres, and always will be. That is the genius of the scheme, and it’s not broken. Yet. You need to understand some very basic legal principles Mr. Snyder. 1. Perry, are not injunctions and/or import exclusion orders still available against “against copycat knock-offs” [competing products]? In many cases might that not be more valuable than trying to collect an uncertain amount of damages? 2. Don’t you think that part of the “blame” should be assigned to the Congress that wrote a special design patents damages statute without consideration of it leading to unreasonable design patent damages recoveries for certain multi-component products for which the design patent is for only one partial feature thereof? “Clearly, the first article of manufacture is not the same as the second. The first refers to the patentee’s product, the second to that of the infringer.” ? Doesn’t design patent infringement determination require comparison of the design patent drawings [NOT the patentee’s product] to the alleged infringing product? Your point 2, Paul, is dispositive – but clearly, it is beyond the power of the Court to re-write the statutory law as written by Congress. 1. First, injunctions require a showing of irreparable harm, meaning one must prove a causal connection between the claimed design and the harm, which is very difficult to prove, for any design/invention. Moreover, getting an injunction granted by a court takes a lot of time and costs a lot of money. Second, an import exclusion order is even more expensive, having to go through the ITC for a compressed year of full litigation on the merits. A major value of Section 289’s total profit rule (Sotomayor insight: “total means total”) is to settle cases before a lot of money is spent on litigation. And such settlements almost always include an effective injunction, i.e., a promise by the infringer to stop selling. If a design patentee had to settle for a 5% royalty under Section 284, the infringer would regard it as a cost of doing business, and would copy again, and again, and again. So, the total profit rule is an appropriate deterrent against copying. 2. You assume the total profit rule for a multicomponent product is unreasonable. I disagree. First, all products are multicomponent products, combinations of old/new components. Second, and much more importantly, why do you think Samsung copied various features of the iPhone, including the 3 designs litigated in this case? It was to sell Samsung smartphones!!! The evidence was unequivocal about that. Samsung’s purpose was not to sell a case with rounded corners and a black front face in a vacuum, or an array of colorful icons in a vacuum. It was to sell their smartphones. And they did sell a sh*tload of smartphones only after copying the iPhone and its unique, design patented features. Is it unfair or inequitable for Samsung to disgorge its profits resulting from its bad acts? I have to point out that all 3 design patents were fully and thoroughly litigated, and found not invalid, and found infringed. Why should we let Samsung retain even a fraction of the money it made as a result of its having copied the iPhone? 3. You are correct about the test for design patent infringement. I was talking about design patent damages, after infringement is found. More particularly, my critique was directed towards the SCOTUS deeply flawed argument where it said that the article of manufacture in 289 can be a component because the article of manufacture in 171 can be a portion of a product. Terrible logic, because it’s not the same article of manufacture. If the infringer does not agree to discontinue infringing, the patent owner is damaged by a willful infringer. There is nothing in eBay that suggests that this should not be the continuing rule. No one has a right to infringe, and the patent owner should not be forced to sue a willful infringer again and again over the very same infringement. My bad, Ned. I should have said “preliminary” injunctions, which are usually the only kind that are helpful to a design patent owner. Perry, If I have a patent on a design for a tennis ball and I apply it to a tennis ball ornament of a car, do I get the entire profits of the car? I think there has to be some correspondence between the patent and the article of application. Now casings for a product, permanently part of the product, are a particular kind of article. I believe the law will develop that with casings, the article applied will be the deemed to be the product because the casing and product are one. The casing defines and helps identify the product. It gives the product an appearance identity, much like the body of a VW Beetle. Unless of course (using your logic) the casing is designed to be extrinsic and replaceable, then the case would not be “substantial” to what is carried within the case (much like Malcolm’s box for a diamond). But before you get there, let me know who is writing this new law please. Yes. As I have said on numerous occasions, a signal, a thing made by man or machine, is an article of manufacture. Nevertheless, Les, is controlling law. This decision made the front page of “USA Today” newspapers this morning. Dennis questioned me below regarding me stating that we now are going to have an equity test up front. The quote above make clear what is going to happen. The relevant “article of manufacture” is going to be decided —likely my guess–by the judge and this decision will decide whether the damages are small or large. So—again–what we are like to get is an Alice type of situation where a judge looks at something and decides what is going to happen. This isn’t a legal system, but a system of kings and queens deciding. I think that Sotomayer said that if a design of a VW Bug was copied, then it would be the whole article of manufacture, but that in this case maybe it is only a small part. So, damages could be from $1 billion to maybe $100k depending on the article of manufacture the judge selects. But, let’s see what the test ends up being. My guess another Alice/KSR type of test of equity. Also, please note that I can levitate. I believe this is very rare. When you issue literally millions of patents, you create a defacto equity system, or commerce becomes impossible. Check out US D610250 (in litigation right now) and explain how that patent even issued, let alone how commerce can be maintained in the face of such frivolity. And so ends western civilization with ignorance of the masses….. Please ask Dennis for an icon that includes clothes. And here we all were, thinking Trump saved Western Civ. What, you don’t like my sweater? Put on a Liberace mask, and you will make Malcolm all agaga. you don’t like my sweater? A late entrant for Comment of the Year. Martin, as discussed on this blog before, and proven by a study by Dennis, the PTO rarely refuses design patent applications on 103 obviousness grounds. One sued by a design patent should thus file an IPR with good similar configurations prior art, which can be advertising displays or any other published product photos, not just patents, and not necessarily limited to the same product line. Plus a declaration by a one of ordinary skill in the art [a professional product appearances designer] with a reminder that KSR particularly applies to design patents because professional product designers, such as the IPR declarant demonstrated, work on product designs on many different products. Paul that is the immediate logical path, but a successful IPR is still $400K, if you are lucky enough to stay your district case. If not, double the bills. One takes a horrific beating, win or lose. 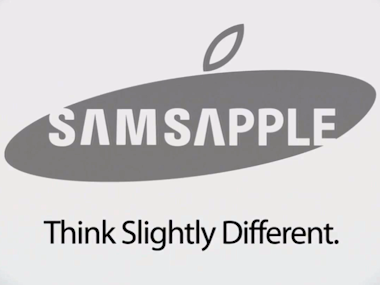 Paul, most people would not care if the Apple design were deemed “obvious” to an expert designer; what they would care about was whether Samsung copied it to piggy back of Apple’s success. The only defense that should be available in this situation is whether the design was functional so that it was functionally necessary to copy to compete. Ned, yes, no doubt eliminating any invalidity defenses against infringed design patents would be highly lucrative for some patent attorneys. Martin, methinks you despair too much. That being said, the Supreme Court has time and again called for clear and definite claims, yet the Federal Circuit and the CCPA before it seemed to think that one determines clarity after construction, not before. However, what if we only published the claims? I would say that if one could not tell exactly what new from the claim itself, then the claim should be declared indefinite. Perhaps we can get the Feds to go that way at some point in time. One of the more bizarre ideas yet Ned. Tell me the difference between that and when we had no claims (because your idea leads to that same landscape). The article is the display of an iPhone. 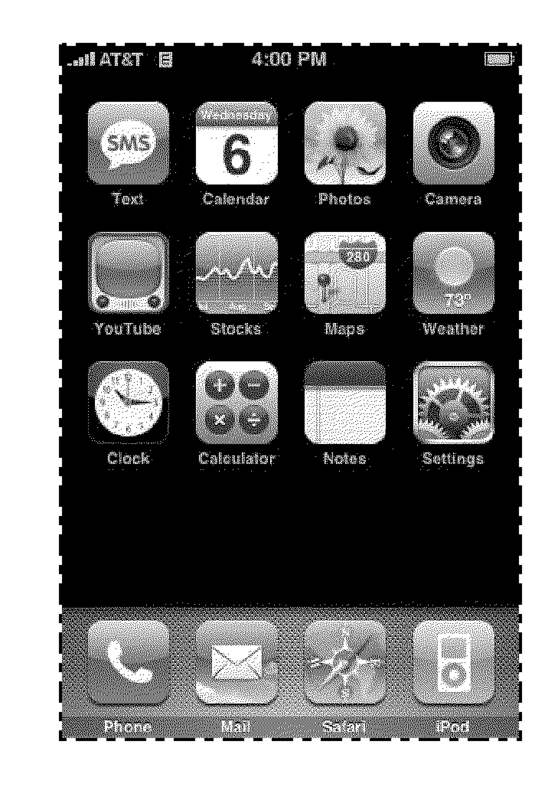 The design is of the GUI applied to the display of the iPhone. The question that I think that needs to be answered is whether the temporary state of the display is “applying” the patented design to the article. I can imagine a future where things like cars or even clothes look the same physically but whose designs are changed by displays. The question may become whether the display is somewhat permanent as opposed to being user-variable. I think the iPhone Gui is somewhat user-variable. It’s easy to see how the ridiculous zillion dollars in damages resulting from the CAFC’s interpretation of the statute could get even more ridiculous when the “ornamental design” is displayed for, e.g., half a second, after a button is “activated”. The button whispering arts definitely took a hit today. Are you suggesting that the affixation of the design must be permanent? An interesting thought, but can you tie that to something in the statute? The iPhone sits there, unpowered, waiting to be sold. The screen display that occurs occasionally when powered and used can hardly be said to be “applied” for the purpose of sale. Do you normally buy an electronic device to not power it up? You are definitely being bizarre Ned. Further Ned, you have not tied your proposition to the statute. This sounds like the same game you play with the ROM. But seeing as Design Patent law is such a poor fit with a set of laws set up for utility, this might be worth considering (if he can tie the idea to the statutes). What does permanence have to do with it? The assumption in some comments above is that the Fed. Cir. will now have to develop a damages theory here. Why now? Isn’t it more likely that they can just pass the buck down to the D.C. and then decide on appeal if they approve the D.C. decision? Very true Paul, as they have shown in other ways that they can learn from the Supreme Court how to pass the buck (or simply do what they want to do). Applying a design to a multicomponent article might factually involve applying the design to multiple components of the article. In cases where the design IS the overall shape of the entire article, presumably “applying” the design to the article or equally that the article has had the design applied to it, is the act of forming of the article to that shape or the fact of that article having been formed into that shape. For a multicomponent article, where the design is the overall shape, in order for the design to be applied, both the container and that which is inside it must be shaped in accordance with the design: in fact all of the components must be formed and/or shaped and carefully arranged so as to complete the overall design once assembled. If the article also involves a waterproof skin, or a soft shell OVER a hard shell, or even a further coat of paint OVER the soft shell, etc. each of these also has the design applied to them.. they take on the overall shape. Far from the innards of something not having had the design applied to them, they have been carefully arranged and interconnected and fit together so as to bring about the shape and form of the design, and but for that careful arrangement, interconnection and fitting, would not exhibit the design. The design when it is a shape, (and unless there is practically nothing but empty space inside) is applied to the container and the contents. You have an ornamental design for the shape of a box. I sell enormously expensive diamonds ($1 million per diamond). I sell them one at a time, inside a practically empty 50 cent box that infringes your ornamental design. According to your theory, you’re entitled to my profits? I don’t think so. So what? A five year old can sit around and draw the exteriors of useful things. You think because you drew an exterior that you’re entitled to the profits for all the work I did fitting stuff inside the exterior? That’s absolutely absurd. Design patent law is a j0ke and it’s your kind of rabidly maximalist views that are imploding what tiny amount of s@nity is left in the system. Design patent law never had any “s@nity in the system” because it was always a bas terdized glop into a utility law system. This has nothing to do with maximimizing the good that patent law and its Quid Pro Quo brings. I am only opining that the infringer “applies” the patented design to a great many articles of manufacture which makes up the multicomponent system (such as a smartphone) when he/she shapes it to look like the patented design of the patentee, and that because of the constraints the shape impose, the design is applied to the internals as well. You might have to forgive Malcolm as he lacks any real world engineering experience and did not recognize the condition of design constraints on related engineered products. Did you guys hear about this “new textualism” thing that is the new rage in constitutional interpretation yet? Seems rather interesting in the patent context as well. I suppose I can, will take awhile though, busy week and weekend. Have work, workouts, a few girls, and have to help with a major party for next week. But I’ll try to keep it simple. The article – while interesting, is written in a decidedly one-sided fashion. Tell me 6, did the those put the patent clause in the US constitution mean to advance the useful Arts in the UK or in the US? If the former, why did the original patent acts limit the ability to obtain patents to US citizens? Whether or not the citizenship requirement is there, patent law remains a sovereign-centric type of law. Any treaties entered into just reflect a desire to be treated on the same standing within the individual sovereign. Such does not change one whit the aim of the still sovereign-centric laws. Of course, this is only too gleefully obfuscated by the Trans-nationals and their minions. If we learned anything from present election it is that treaties can make the playing field level with respect to location of R&D and the location of manufacturing so that big business can locate anywhere and have the same legal and financial benefits. Thus they locate their R&D and their manufacturing to maximize profits by taking advantage of low taxes, low regulation and low wage rates. Level playing fields have now become an issue and we must pay attention to whether leveling the patent playing field advances the useful arts in the United States or negatively affects the United States in terms of undermining American R&D and American manufacturing. For example, because of America’s high taxes, high regulation, and high wage rates, level playing field undermine the reliability of manufacturing jobs and R&D jobs. How can the average American youth go to college and earn a degree in a discipline where he is in effective competition with the rest of the world for employment. Programmers and engineers already know that their jobs can be replaced either by moving programming and engineering jobs offshore or by moving foreign programmers and engineers on shore. Advancing the useful arts in the United States must be intended to advance American R&D an American manufacturing. Treaties that undermine this purpose have to be looked at carefully. Laws that are enacted to obey these treaties have to be reviewed and potentially revised or scrapped. You are correct Ned – I should have been more particular. Let me clarify that I should have said that any treaties that still promote US interests (as opposed to kowtowing to some mythical One World Order) would reflect a desire to be treated on the same standing within the individual sovereign. I will say that I agree with your Merica first approach Ned. But I will also say that it seems like we stray far from it in our modern laws. I’ve been thinking lately of whether we should make all federal public servants swear not only to the constitution, but also to Merica. Well, 6, we have gone too long with the assumption that free trade was good for the US. What this election has done is wake everyone up. It has caused us to reassess those assumptions as jobs, including R&D, are shipped abroad at ever increasing rates. We need to reassess free trade; just as we need to make sure that our national interests are involved before we intervene in other peoples wars. Yeah, 6, think of George Washington on that latter point. Good question Ned. I’m not knowledgeable enough about the topic to know. STUNNING, high level jurisprudence from the SCOTUS. Ground-breaking stuff. …and what are your views that if indeed patents are classified as public rights, then the entire foundation (which is based on patents as property) of the exhaustion doctrines is thrown out the window? Do you attempt to re-insert some type of “but they are property too” thinking to salvage exhaustion? “But they are property too” doesn’t comport with public rights doctrine. Hence the absurdity of the current state of US patent law, and separation of powers jurisprudence generally. But hey, at least we are getting 9 pages or whatever of hard hitting design patent stuff from Sotomayor. Thanks anony – but does not answer my question. What do you think should happen with all of the exhaustion doctrine rulings (seeing as those rulings are premised on the view that patents are property rather than public rights items)? Is there no such thing then as exhaustion? Any concept borrowed from traditional property principles will likely be done with a nod and a wink to the underlying reality / problem (?) that the Court is addressing public rights, and not private property rights. The hush hush don’t tell aspect makes sense from the Lemley cabal, but Mossoff et al have been strangely silent. I agree with you that the deeper ramifications of patents not being property have been glossed over rather severely (from almost all concerned parties). …if that is what you are getting at, that is. Yep, that is 100% what I am getting at. Team Lemley has incentive for hush hush – without it, his Article I darling becomes at best an advisory mechanism. God forbid the Europeans find out! Oh, the humiliation. Team Mossoff conversely appears to be afraid of it, and rightfully so. After all, who wants to loudly advertise to Trump et al that they now have power to remove patent validity from Article III? the deeper ramifications of patents not being property have been glossed over rather severely (from almost all concerned parties). Your (actual) silence on the implications is also noted, Malcolm. Sale of goods=sale of patented goods=sale of patent rights? Which means that Congress can provide other than exclusive rights? There is dissonance between the idea of “securing” exclusive rights to inventors and the idea that patents are revocable privileges conferred by Congress. There is more than just mere dissonance, Ned. So, now we have a new test. How important is the design to the product? The design of the VK bug we are told would mean the whole product. So, another equity test up front. The judge decides whether to chop the damages to near zero or not based on ….well, based on how they feel about things. Oh boy. Has anyone else notice how the SCOTUS is making district judges like kings/queens? The judge decides whether to chop the damages to near zero or not based on ….well, based on how they feel about things. Sure, that’s a reasonable take-away. Did you finish that bottle of Jim Beam already? Night, your post here does not appear to be based upon reality. The Supreme Court decision here does not authorize to make unreasoned or unsupported decisions. What then is the test of whether a product design is iconic or insignificant? Sounds like the judge is going to decide that and thus whether the damages are small or large. If the product design is iconic, then it’s likely entitled to trade dress protection. Design patents have nothing to do with whether the design is iconic or has secondary meaning. Those would seem to fit into secondary indicia of non-obviousness. The attempts to fit design patents into the utility patent sections is an error waiting to happen – nothing good can come from that. It would be far better to simply redraft design patent law from the bottom up realizing that design patents and utility patents are quite different animals at heart. “anon” It would be far better to simply redraft design patent law from the bottom up realizing that design patents and utility patents are quite different animals at heart. Lol – you are welcome. This is almost as helpful as Justice Thomas’ “what’s an abstract idea? I know it when I see it” analysis. Regarding “abstract,” that was the test advocated by Rader and adopted by the court in Kennedy’s majority opinion in Bilski. Give us a break, Seth. Why do lawyers have to play these games? The relevant arguments you can come up with are just too s*cky so you have to kick some dust in the Justices faces? Go take a shower, Waxman. You stink. The factor that seemed to bug the most folks about this case until now was not the above questions it was about collecting the entire profits of an entire line of smartphones with design patents only covering the rounded beveled corners on the outer case. * At least that IS now clear – it is eliminated here. *[Much of that particular expressed outrage was, of course, really questioning why this kind of design patent was not better handled on a 103 basis more like it could have been for utility [normal] patents? Further confusing the effect of this decision is the report that Samsung has already [contingently?] paid the damages it will now presumably get substantially reduced by this case being sent back to San Jose for a new D.C. damages trial? Can anyone clarify THAT? Samsung is entitled to a refund of the damages it’s paid, possibly with post-judgment interest. But it seems likely won’t get any until the Federal Circuit’s mandate – which will be several months away. That’s because the Federal Circuit is going to have to come up with the test, which will take rounds of briefing and possibly oral argument. And then they may just vacate and order the District Court to take evidence on the issue. Who really knows? Ned, even the oral argument admissions seemed to make it clear that THIS multi-components and software product, for those particular design patents, was not going to be one of those “sometimes” any more than that refrigerator door handle design patent case you were citing earlier. The Supremes need a lesson in reality here. Only the final product is the product sold (this is the tie to profits). If a component is not sold, then there are zero profits according to that component. All the Court is doing here is doing (yet another) end run around the statutory law set in place by the branch of the government allocated authority to write the statutory law. The score board is broken folks – it’s important to note that. To perhaps glean some objective statutory law nugget from this decision: the object of the qualifying phrase “article of manufacture” is “for the purpose of sale“. If there is a separate aftermarket for components of a larger item offered for sale, the operative words reach that aftermarket in addition to the main market. To deny the main market – for what is actually the purpose of sale – would be the Court calling “black” as “white” in their own fashion of construing the operative term too narrowly (in order to reach a desired Ends through the improper means of rewriting statutory law from the bench). As I predicted back in 2013 that Samsung needs either an act of Congress or “a trip to the Supreme Court” to obtain an economically efficient interpretation of 35 U.S.C 289 (design patent damages) to undue the economically inefficient CAFC’s interpretation of “Article of Manufacture”. See “Inefficiencies in Overcompensating Design Patent Damages under 35 U.S.C. §289 in Complex Technologies.” 95 J. Pat. & Trademark Off. Soc’y 444,458 (2013). In the decision, the court offered what it termed a “broad” meaning of “article of manufacture” as “a thing made by hand or machine.” Although broad, the definition appears to exclude digital and virtual designs. I query here whether Apple’s patented “graphical user interface for a display screen” at issue in this case fits this definition. Design patents that read on patterns of light emitted from a general display apparatus are absurd and always have been. You can sell a general display apparatus but you can’t sell the emitted light. The light isn’t “a product” and it’s not applied to anything. You could not be more incorrect, Malcolm. But that’s no surprise as you nonetheless make use of those very “images of light” with every interaction with your smartphone. I also make use of the sound waves coming from my radio. And you can “visualize” them. That doesn’t mean they are the proper subject for a design patent, and a 1000 scriveners saying otherwise doesn’t change a thing. No one is saying anything about anything being proper just because a thousand scriveners say so. Now if you want to focus on the why a “thousand scriveners” are saying what they are saying, that would be an entirely different matter than what your post is aimed at. Isn’t a computer GUI arguably “made by machine”? Xerox also won the subsequent critical expanded-Board decision in Ex parte Strijland (Bd. Pat. App. & Int. 1992) [with its important dicta on the need for a dashed-line showing of the article of manufacture screen on which the icon is displayed]. But the “produced” light rays aren’t a “product” that’s offered for sale. To suggest otherwise is to suggest, equally, that you could get a design patent on a color, or a series of colors, emitted by a flashlight. The point of the “made by a machine” language is just to fill in the gaping loophole that’s created if you take this biblical “hand of man” silliness literally. Nor are the light rays reflected from a carpet having a patented design. You sell the carpet, not the specific pattern of absorption and reflection of light that it produces, right, Mal? Of course, that requires ignoring Congress’ explicit action to reverse the Court’s decision in Dobson. Indeed. And the design on the carpet just magically comes right along with it. How does it happen? Scientists are still puzzled. Some people say it’s a total mystery! Where do the invisible monkeys who make that pattern visible go when you turn the carpet off? So it goes in our new fact-free world. Yay! Indeed. And the design on the carpet just magically comes right along with it. So, then the damages are the total profit for the sale of the carpet. And similarly, the damages for the design implemented in the phone is the total profit for the sale of the phone. Gosh, glad the court spent so much time on a decision that merely affirms what the statute and lower court said. Of course, why did they say “reversed” in the opinion? MM, I don’t have a personal view on that non-sticky-GUI [pun intended] subject, nor would it be relevant. But note that as I explained in 3.2 above re Ex parte Strijland, you should not get a valid design patent on just the display itself – it should be shown on at least a segment of a physical display screen. [Or at least verbally limited thereto]. There is also an old CCPA decision holding valid a design patent on a colored water fountain display. Yes, they are transient, but so are you and me. The whole “transitory/non-transitory” attempted distinction is malarkey. Look up into the clear night sky for some transitory things that have existed long before the human race existed (and will exist long after the human race has departed). When you claim a GUI you are claiming the interface, not actual step of displaying of visualizations as perceived. You can infringe a GUI claim by having a program that when executed generates a certain visualization even if the infringing code has not yet been executed. No “color, or a series of colors, emitted by a flashlight” need be displayed to infringe a GUI claim as you are not claiming the actual step of displaying, but the means for displaying. You can buy and sell software code, or hardware. You don’t need to turn on the software or hardware for it to infringe. That’s actually a far worse admission. Thanks. Malcolm, your “[Old Box] already has all future improvements by way of software ‘already in there‘ mindset” is getting in the way of your understanding the comment by Mike. Mike, what you are talking about is a utility patent on a GUI, not a design patent [in which the claim is defined by the solid line drawings]. MM if the emitted light is a copyrighted motion picture, you indeed may sell it and prevent others from copying and selling it. How apoplectic do you think Malcolm would get if the patent protections carried such criminal penalties? Speaking of the Supremes, oral arguments in Lifetech v. Promega will be held today. On January 3, 2017, D’s will hold the majority in the Senate for a few minutes, until the newly-elected Senators are sworn in. Biden could convene the Senate in those few minutes and call for a vote. The majority could then suspend the rules and vote in Merrick Garland. The key here is that VP Biden would have to be willing to convene the Senate and recognize Senator Durbin instead of Mitch McConnell. Durbin moves to re-nominate Garland, and Senate D’s then vote to confirm him. They will have a quorum for those few minutes. It’s bold. Garland would be confirmed by 34 D’s and no R’s. Bold … but maybe …. unc i v i l! And unprecedented. But legal… How did we get here in the first place? Your friends at PatentDocs already have a post on the Lifetech matter. This opinion felt like they are punting because they didn’t want to come up with a test or because they were split on the ultimate issue. I’m not sure how easy it is to come up with a test, and even if you do, it makes the damages calculation very difficult. How much of the profits do you attribute to the component? Economic experts will have a field day, but the end-result of this will be the end of design patent litigation in the electronics industry. Which I suppose might be the point. Interesting developments in the SmartPhone market is the large number of new entrants: ZTE, OnePlus, Nextbit, HTC, ASUS, Alcatel, etc. Hopefully this IS the end of billion dollar design patent litigation. It will be interesting to see what the CAFC does now that it’s been given a free(r) hand. Come up with a complicated, multi-part test that doesn’t provide much guidance. It’s clear that if they say the whole phone is the article of manufacture in this case, it will go back up and get reversed. Other than that, who knows? Dennis, I don’t follow this as close as you. Remind me, was there an injunction issued for infringement of this design patent? Well Dennis, this is impossible. Mark Lemley has declared their is a thicket that prevents this so there aren’t more entrants. Oh wait…reality. Dennis, not my reading. Apple still has chance and I would say a good change to prevail on remand. the end-result of this will be the end of design patent litigation in the electronics industry. Which I suppose might be the point. It’s going to be yuuuuge in Europe! Just yuuuuuge! Seriously, though, any ambiguity will be exploited until its smacked down. The design patent owner will argue that it’s entitled to the “ornamental design” of the upper right hand corner of the “virtual call redial button” displayed on the smartphone. And the design patent owner will argue that people buy the phone because of its awesome non-obvious virtual button designs. And it will pay an expert to testify to that point. And the design patent owner will argue that people buy the phone because of its awesome non-obvious virtual button designs. With most phones having near-identical innards, people do choose one over another based on the aesthetic design of the OS. The thing about design patents that made them easy to sue over was that you didn’t have to come up with those theories. Damages experts are obscenely expensive and I think this will dissuade smartphone design patent litigation, which is what the Court wanted.